In addition to the universal feasts of the Mother of God, from the Immaculate Conception to the Assumption, the Church also keeps local feasts connected with the major centers of Marian devotion, such as Loreto in Italy, Walsingham in England, Guadalupe in Mexico etc. A similar custom holds in regard to the Archangel Michael, and in one sense, may be called a universal custom of the Western Church. His principal feast on September 29th originated with the dedication of a church built in his honor a few miles outside Rome off the via Salaria; this feast’s title remained “The Dedication of St Michael” for centuries after the church itself fell into ruins and was abandoned. The Ambrosian liturgy received the feast from Rome, and kept it with the same title, using several of the Mass chants, as well as the Epistle and Gospel, from the common Mass for the dedication of a church. However, the Roman Martyrology refers the September feast to neither of these churches, but rather to the shrine of St Michael on Mount Gargano in the Puglia region of Italy, generally honored as the first church dedicated to him in the West. Today’s feast is called the “Apparition of St Michael’ from a story which takes places at the end of the 5th century, and is not reported consistently in ancient sources. The version given in the Breviary is that a bull belonging to a fellow named Garganus wandered into and got stuck in a cave on the side of the mountain. When someone launched an arrow at it, it flew back at him; the inhabitants of the area then asked their bishop what to do about this portent. After the bishop had declared three days of prayer and fasting, St Michael appeared to him and told him that the place was under his protection, and a church should be built there in his honor. The apparition of St Michael on Mt Gargano, by Cesare Nebbia and students, from the Gallery of the Maps in the Vatican Museums, 1580-84. The Martyrology describes this church as “vili quidem facta schemate, sed caelesti praestans virtute – made in a mean fashion, but outstanding in heavenly might.” In point of fact, much of the church is not “made” at all, at least not by human hands. Mt Gargano is a large massif, rather more like a mesa than a hill, very steep on the northern side where the sanctuary is, with the town of Monte Sant’Angelo located on top. One enters the shrine through a forecourt in the town, and after passing the doors, descends to the church by a considerable number of steps. The church itself is one half natural cave, and one half a set of rooms, including a choir and a relic chapel, built in front of the cave’s opening, and supported from beneath by enormous buttresses that reach quite far down the massif. 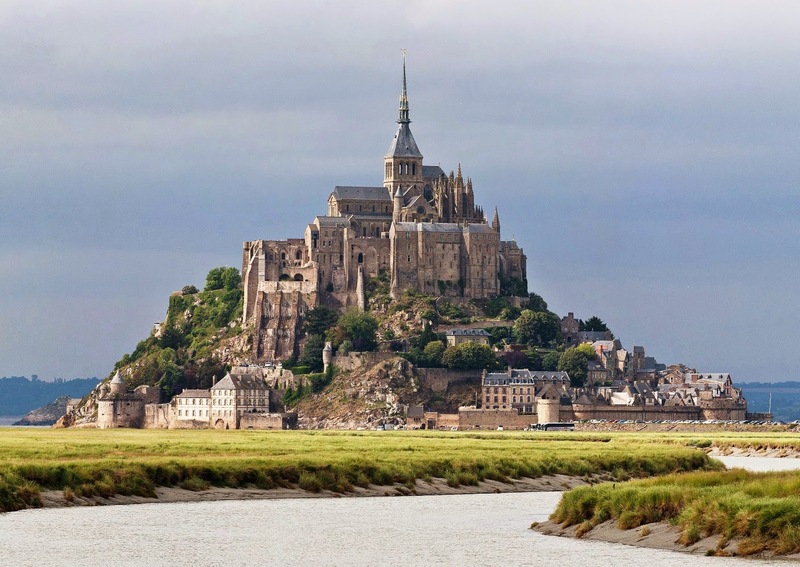 In northern Europe, Mont-Saint-Michel holds the same place that Monte Gargano holds in Italy, and the feast of St Michael’s apparition there is kept on October 16th. In the Sarum Breviary, the Matins lessons for this feast begin with an acknowledgement that the devotion to him on Gargano was older. 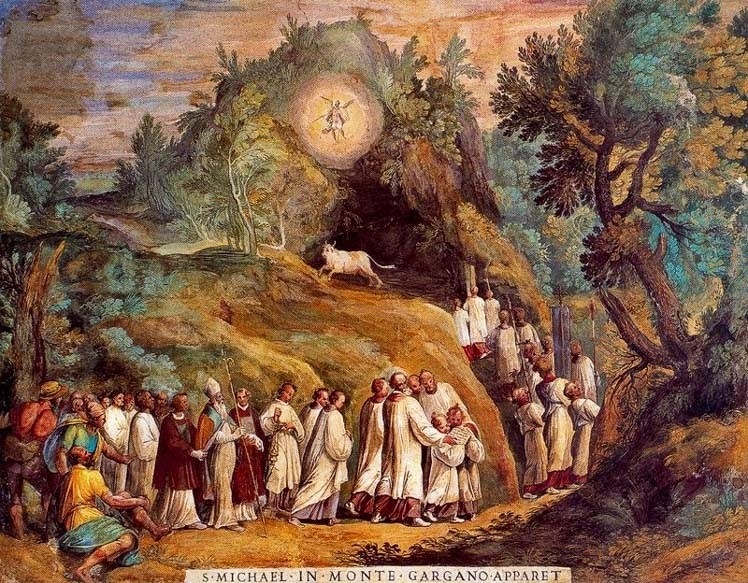 “After the Frankish nation, marked by the grace of Christ, far and wide throughout the provinces on all sides had subdue the necks of the proud, the Archangel Michael, who is set in charge of Paradise, who had formerly shown that he wished to be venerated on Mount Gargano, by many signs showed that how he ought to be honored in the place which is called by the inhabitants ‘Tumba.’ ” (Mons Tumba is the Latin name for the Mont-Saint Michel.) The story continues that in the early 8th century, St Michael appeared three times to the local bishop, St Aubert, and ordered him to build not just a sanctuary, but a replica of the one on Gargano. The Byzantine Rite keeps a feast on a similar line, related to a shrine in Phrygia, in west-central Asia Minor. 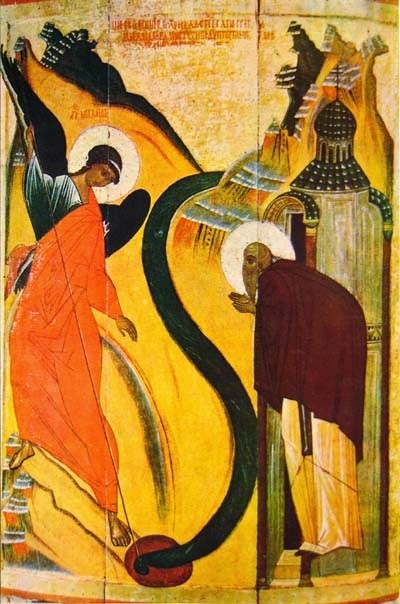 At Chonai, near the city of Colossae, (the Christians of which received a letter from St Paul), St Michael appeared to the father of a mute girl, directing him to bring his daughter to a nearby spring, where she miraculously gained her speech. A church was then built over the spring, which attracted many Christians and led to many conversions. The local pagans thought to destroy the church by diverting two nearby rivers towards it, but St Michael came to defend his shrine personally; as he struck a rock nearby, a fissure opened in it which swallowed the rush of water. The feast of “the Miracle of St Michael the Archangel at Chonai” is kept on September 6th; the Chudov Monastery in Moscow, formerly an important center of learning, but now destroyed, was named for this miracle. There were several churches in Constantinople itself dedicated to St Michael; the dedication feast of one of these became the general commemoration “of All the Bodiless Powers”, celebrated on November 8th, just as the Roman feast on September 29th also became the feast of All Angels. A 15th-century Russian icon of the Miracle of St Michael defending the church of the springs at Chonai. The two hymns of St Michael were among the most drastically altered in the revision of Pope Urban VIII; here is a nice recording of the original text of the Vesper hymn, retained by the Benedictines and the religious orders with proper Uses, in alternating Gregorian chant and polyphony.